Animal Name Letter Tracing Pages for Preschool and Up! 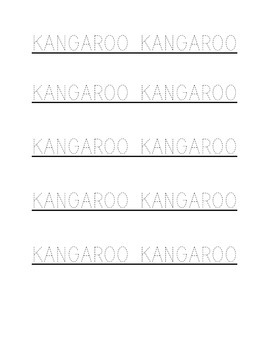 This product contains 63 letter tracing pages featuring the animals found in the Earth Is a Zoo Preschool Curriculum. Each animal has a page to trace its name, a page to trace the first letter in its name, and a page to trace an alliterative sentence about the animal. Use all three or choose the one that fits your child's reading level. This product is just one of the many offerings of the Earth Is a Zoo Preschool Curriculum. If you enjoy this product, please make sure to check out the other components of the curriculum that feature the same animals: The Animal World Map,The Animal Information Pages, The Animal Coloring Pages, The Animal Math Pages (coming soon! ), and the continent information pages (coming soon!). If you like this product, please make sure to leave a rating!